Old Mission Peninsula is20-mile long finger that splits Grand Traverse Bay in half and is best known for its cherry orchards and vineyards. But at the tip of it are a pair of parks that combine for 650 acres on the 45th Parallel, include a historic lighthouse and almost 10 miles of trails. Adjoining Lighthouse Park to the south is the 520-acre Old Mission Point Park and three trailheads serve the interconnecting trails with the most popular one by far being Lighthouse Park within a stone’s throw of the historic lighthouse. Old Mission Peninsula is 20-mile long finger that splits Grand Traverse Bay in half and is best known for its cherry orchards and vineyards. 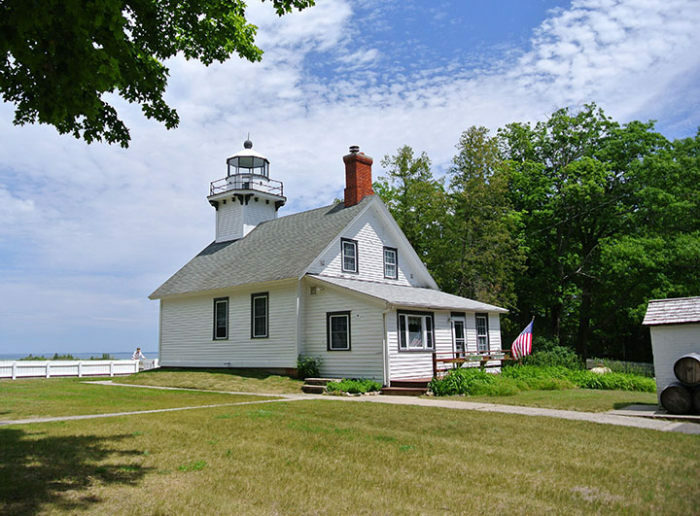 But at the tip of it are a pair of parks that combine for 650 acres on the 45th Parallel, include a historic lighthouse and are laced by almost 10 miles of trails. The 120-acre Lighthouse Park preserves the very tip of the peninsula and is home to Mission Point Lighthouse. Built in 1870, the lighthouse lies halfway between the North Pole and the Equator and for 63 years warned mariners of the rocky and dangerous waters at the north end of the West Arm of Grand Traverse Bay. In 1933, it was replaced with an automatic buoy light just offshore and in 2008 re-opened as a museum. Adjoining Lighthouse Park to the south is the 520-acre Old Mission Point Park. Much of this land were cherry orchards before the state purchased the acreage in the 1980s. Eventually the land was leased to Peninsula Township which developed the current trail system, merging the existing trails in Lighthouse Park with new segments in Old Mission Point Park. Three trailheads serve the interconnecting trails with the most popular one by far being Lighthouse Park within a stone’s throw of the historic lighthouse. 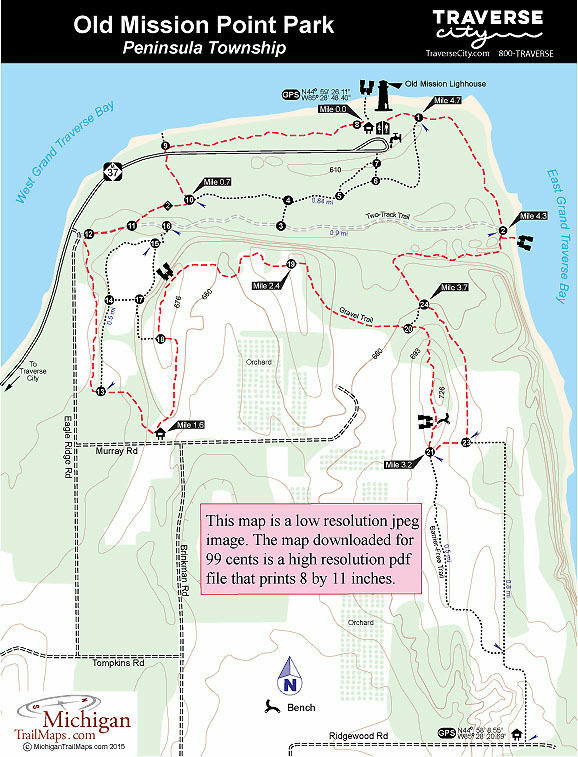 This hike, a 5-mile loop through both parks, is a mix of foot paths and old two-tracks that passes through a variety of terrain and scenery, including both the West Arm and the East Arm of Grand Traverse Bay, before returning to Mission Point Lighthouse. The trail junctions in both parks are identified by a number. This hike begins at post No. 8 just past the Hessler Log Cabin, a classic log cabin built in 1854 and eventually restored as a small museum. Head west through the narrow wooded strip of Lighthouse Park bordered by the West Arm to the north and M-37 to the south. You pass two spurs that extend in both directions to the bay and the highway before the trail swings south and passes post No. 9 at M-37. South of the state highway, at Mile 0.7, you arrive at post No. 10. Head west (right); shortly the trail merges into a well-defined two-track and just before Mile 1 arrives at post No. 12 and an unofficial parking area just off Eagle Ridge Road. This corner can be confusing, but simply follow the trail that departs south from the parking area. You begin in the woods but eventually break out in an open field where the trail swings east and passes post No. 13 before returning to its southerly direction and reaching the Murray Road Trailhead at Mile 1.6. A display board and parking are located here while a path, a two-track designated as a barrier-free trail, heads northeast. This trail climbs a low ridge, passes post No. 18 in a third of a mile, and then comes to views of the West Arm of Grand Traverse Bay. The trail swings east off the ridge and becomes more of the gravel surface it was designed to be. It borders the woods here where to the south you can see rows of grapes outside the park, no doubt destined to become bottles of renowned Mission Peninsula wine. You reenter the forest near post No. 19 and at Mile 2.9 arrive at a junction marked by post No. 20. Head right as the trail quickly swings south to climb a ridgeline. Glimpses of orchards below and the West Arm on the horizon begin appearing, and then at Mile 3.1 you’re rewarded with views of both bays and a bench to rest and enjoy them. From the viewing point the trail descends and within 200 yards arrives at post No. 20, marking a junction with a crossover spur that heads east. Use this spur to begin looping back north. The terrain from here south to the Ridgewood Road trailhead is mostly open fields and uninspiring. At post No. 23, continue north (left) to reach post No. 24 at Mile 3.7, marking where the trail loops north to reenter Lighthouse Park. 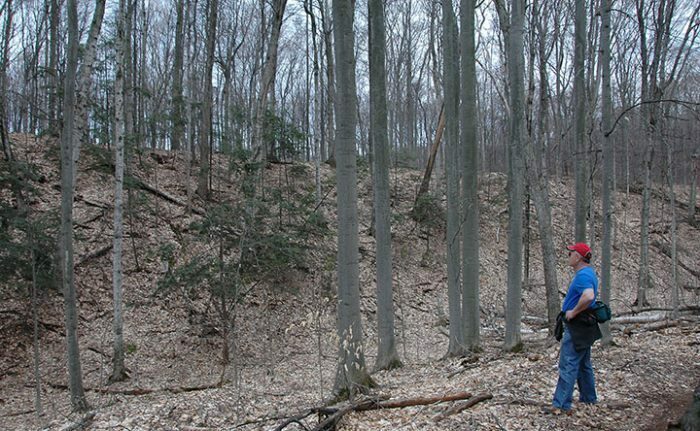 The terrain and the older forest found here is much more interesting than open fields especially when the trail swings east to wind through a series of moraines before reaching post No. 2. Reached at Mile 4.3, this post is located at the end an old two-track where a side trail provides easy access to the shoreline of the East Arm. Continue north on the foot path as it skirts the East Arm. Even if you can’t see the water through the trees, you can often hear the surf on a windy day. At Mile 4.7 the trail swings west to arrive at post No. 1, marking a junction with a trail that heads south (left). Continue west (right) and in less than a quarter mile you’ll pop out of the trees at Mission Point Lighthouse with the parking lot a short walk away. In Lighthouse Park, the Mission Point Lighthouse and Hesler Log House have been set up as museums. 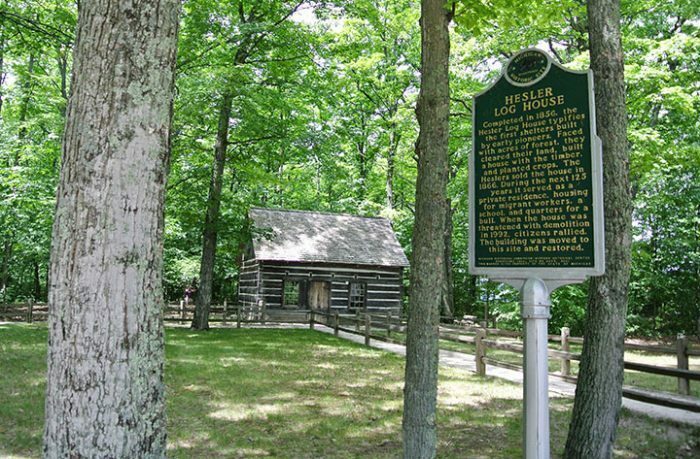 Hesler Cabin was built in 1856 and then moved to its current location in 1992. Also at the park are picnic tables, toilets, drinking water and parking. Old Mission and Lighhouse parks are open year-round and Nordic skiing is a popular activity during the winter. Mission Point Lighthouse is open 10 a.m. to 5 p.m. daily from April through October and 10 a.m. to 5 p.m. on Saturday and Sunday in November and December. 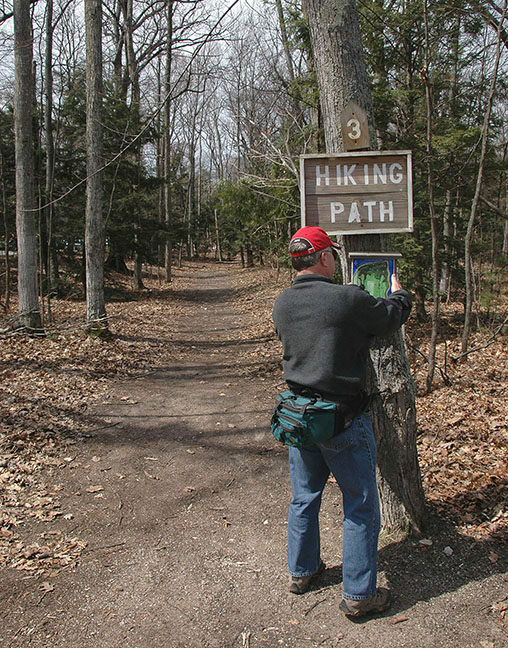 There are no fees to use the parks' trails. There is a small fee climb the tower of Mission Point Lighthouse for the views of both bays. From Traverse City head north on M-37, following the state highway for 18 miles until it ends at Lighthouse Park. Another trailhead and parking area is located in the middle of Old Mission Point Park along Murray Road at the end of Brinkman Road and reached from M-37 by heading east on Tomkins Road. 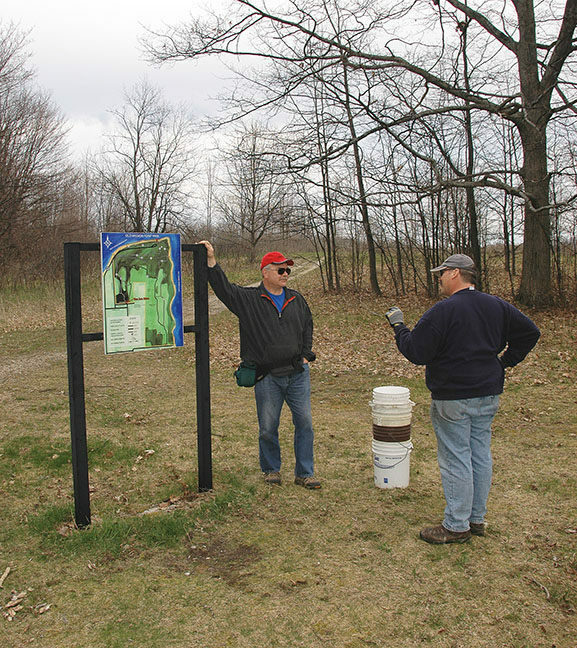 A third trailhead is near the hamlet of Old Mission and reached from M-37 by heading east on Swaney Road. Within 1.5 miles the pavement ends and you turn right on Ridgewood Road where in a half mile you find a small parking area and a display map. For more information on the parks contact Peninsula Township (231-223-7322; www.peninsulatownship.com/parks) or the web site of Mission Point Lighthouse (www.missionpointlighthouse.com).